We headed off early this morning to Mass then came home for breakfast. After that Neil went off to get some fuel for BAT and that turned into quite an adventure. When he arrived the pumps were off, turned out that some woman was pissed because the ladies room was occupied so she hit the Emergency Shutoff button for the pumps. Not sure how she thought that would help but she claimed that she had no idea that hitting the big red switched with the clearly marked label would shut off the pumps. Moron. After some fits and starts turned out the pumps were now broke so he ended up going to BP and paying 15 cents more a gallon. Bummer. After that he came home and went on a bike ride, then Connie went out to get her nails and toes done. Neil sat around and did some computer stuff including getting himself an app named Blogsy so he can do blog posts from his iPad. 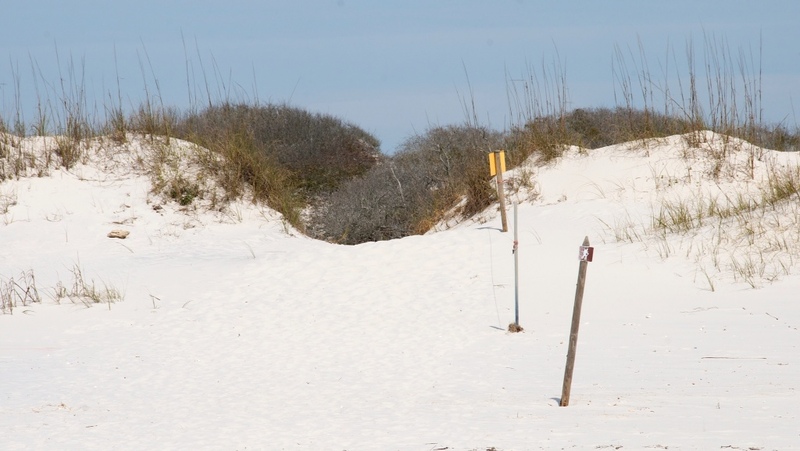 Just to test one of the features, here is another photo of the dunes from our hike the other day in the Bon Secour NWR, these are the dunes immediately adjacent to the beach that we had to slog over. I am also including a photo that was embedded from our SmugMug account, it’s a raccoon family we saw at Corkscrew Swamp Sanctuary while we were parked in Fort Myers a month or two ago. Dinner tonite is leftover Coq au Vin with Polenta, gotta go and start cooking now. I will go ahead and post this but I clearly have some more work to go on figuring out this app, it has a LOT of controls I haven’t figgered out yet.